Vodafone taking BlackBerry Storm 2 Pre-orders | BlackBerry Blast! The BlackBerry Storm 2 is officially out (sorta) by a major carrier. 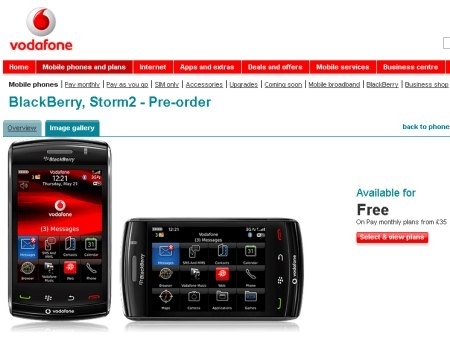 Vodafone has the new BB up on its web site and they're taking pre-orders for the Storm 2. The web site says they will deliver the device on October 26 so it's just a few days away. Specifications include a 3.25 inch 360 x 480 pixel capacitive SurePress touchscreen display. The Storm 2 supports 802.11b/g WiFi and 2100MHz UMTS/HSPA data. It comes with 256MB of flash memory and 2GB of onboard memory with microSDHC expansion. Throw in a 3.2 megapixel camera with video recording, built-in GPS, Bluetooth 2.1, and a 1400mAh battery and you've got a new and improved BB Storm. The best part about Vodafone's Storm 2 offering is the price. It's free if you sign up for a contract. "Order yours today and we will aim to deliver from 26 October. Brace yourself. The Storm2 has BlackBerry's most responsive, comfortable touchscreen yet. Tap to respond instantly to emails and Facebook updates that reach you like lightning. Or get your music, videos, photos and more all in one place. Its look and feel will blow you away too. So will the phenomenal battery life. Your photos get a boost as well - the 3.2 megapixel camera with flash takes care of that. Then show off your shots on the large screen, which is also perfect for viewing websites. There's GPS navigation too, support for popular webmail accounts and the chance to boost the memory with a microSD card. This Storm really is a force of nature."